Now that Hersheypark in the Dark has wound down, it’s time to look forward to the holiday season in Hershey. 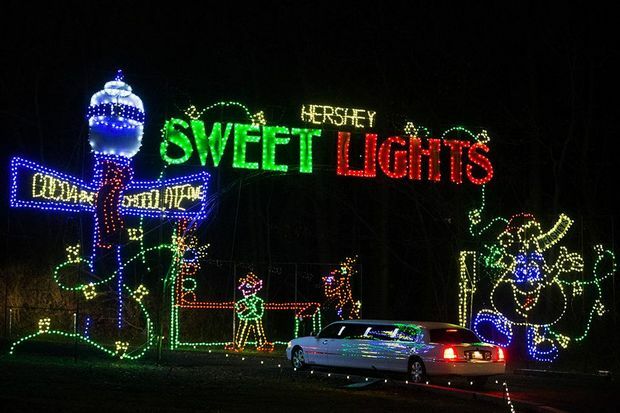 Both the Hershey Sweet Lights and the Christmas Candylane at Hersheypark are scheduled to begin on Nov. 16 this year, and will continue through January 1. More than 45 Hersheypark rides and coasters will be open during Christmas Candylane, including Laff Trakk, Sidewinder, SooperDooperLooper, Wild Mouse, Wildcat, Cocoa Cruiser and more. Get the full list of rides here. Hersheypark is celebrating the 35th anniversary of Christmas Candylane. Four million lights will adorn various sections of the park, which will be open on weekends and Thanksgiving week in November and most days in December. Visitors can also see Santa and stop by the reindeer stables. For ticket prices and hours, visit the Hersheypark website. Hershey made the list of 25 Most Festive Holiday Towns, but wasn’t the only entry from Pa. The Hershey Sweet Lights is located across Hersheypark Drive from the park and features two miles of lighted Christmas displays. Visitors can drive through the 600 outdoor displays, with various prices depending on the size of the vehicle and number of passengers. Hershey’s Chocolate Town, a $150 million investment on 23 acres, will open in 2020. This new section of Hersheypark will include area to eat, shop and play, “transforming the user experience.” Hershey’s Chocolate Town will be for “chocolate lovers who want to have fun, thrill seekers who want to have chocolate, and families who want to experience both.” It will also include Hersheypark’s biggest rollercoaster yet. Hershey’s Chocolatetown: What’s coming to the park in 2020 in the $150 million expansion?